What is an Object Complement? 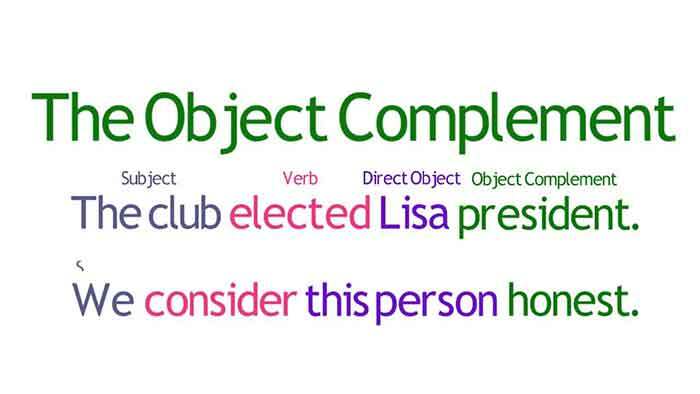 An Object complement (or as it's also known, objective complement) is a word, usually a nounOpens in new window, pronounOpens in new window, or an adjectiveOpens in new window which comes after a direct objectOpens in new window to modify, rename or state what the direct object has become. In other words, a word (or sometimes a phraseOpens in new window) which follows the direct object, and which describes some characteristic of what the object refers to. Gretchen has been keeping the house clean. The empress declared Brigade her heir. The relation between the object and object complement can be represented by the verb be : an implied meaning of the above sentence is that ‘the house is clean’. The object complement may be easily identified by its position, reference, and agreement. It is usually placed after the direct object and referencing the direct object with extra meaning. 1. Andy names his dog Rex. dog is the direct object. Rex is a noun acting as the object compliment. Rex is what the dog has become. 2. They made my uncle supervisor. uncle is the direct object. supervisor is a noun acting as the object compliment. supervisor is what my uncle has become. 3. Gretchen has kept the apartment clean. apartment is the direct object. clean is an adjective acting as the object compliment. clean is what the apartment has become. The objective complement is added to the direct object in order to complete the meaning expressed by the verb (“complement” is something that completes). Thus, in the second example, they didn’t make my uncle; they made my uncle supervior. A simple test for an objective complement is to insert to be between the direct object and the noun that follows: for example, “They made my uncle to be supervisor.” If to be can be inserted in this position without changing the meaning of the sentence, then the second noun is an objective complement. The set of verbs which permit an object complement is not large. In addition to keep and make (as used in examples above), it is commonly used with verbs that express the idea of leave, call, like, want, consider, find, think, get, make, send, turn, elect and vote. Concert–goers considered Mozart a prodigy. The police found the man a raving lunatic. Distinguishing Object Complements from Subjects Complements. Object compliments are utterly different from subject complementsOpens in new window. An object complement gives further meaning to the object. A subject complement, on the other hand, gives further meaning to the subject. An object complement usually comes after a direct object to state what it has become. A subject complement will only follow a linking verb and describes the subject, not the object. Gift is the direct object. happy is the object complement. happy is what Gift, the direct object has become. was is the Linking verb. happy is the subject complement. The Parts of Speech that can function as Object Complements. 1. Noun as Object Complement — Nouns can take forms in a single word or noun phrase to function as an object complement. 1. The Principal named Mr. Briggs the new English teacher. Mr. Briggs is the direct object. the new English teacher is a noun phrase acting as the object complement. the new English teacher is what Mr. Briggs, the direct object has become. 2. Pronoun as Object Complement acting — A pronoun can stand the place of an object complement. 2. They appointed the nominee who was winner. the nominee is the direct object. who was winner is a relative pronoun acting as the object complement. who was winner is what the nominee, the direct object has become. 3. Adjective as Object Complement acting — An adjective can take form in a single word or adjectival phrase to become an object complement. 3. Consistent perfomance made the dancer famous. the dancer is the direct object. famous is an adjective acting as the object complement. famous is what the dancer, the direct object has become. 4. The good grades made Gretchen very happy. Gretchen is the direct object. very happy is an adjectival phrase acting as the object complement. very happy is what Gretchen, the direct object has become.